Formtech Composites’ capability to offer the complete solution from design brief to production has taken a step into the UAV sector of aerospace with manufacturing support on the QinetiQ Zephyr project. 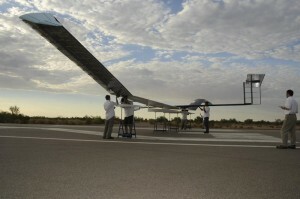 This Unmanned Aerial Vehicle which operates within the HALE (High Altitude, Long Endurance) sector has successfully been launched at the US Army Yuma Proving Ground in Arizona. To date this UAV was launched on July 9th 2010 and is awaiting confirmation of it’s new record with a flight time of 14 days (to be confirmed by FAI). If this is confirmed it will place the Zephyr in the record books by quadrupling it’s own previous unofficial result of 82 hours. This 22.5m wingspan UAV is launched by hand and at little more than 50kg it has an exceptional range of delivery and retrieval options. It operates by day on solar power generated by amorphous silicon arrays and by night it is powered by rechargeable lithium-sulphur batteries that are recharged during the day by the solar energy gathered. Formtech Composites have provided cost sensitive solutions for the airframe components. Working in carbon fibre from QinetiQ’s original designs the items were produced to specification and adapted as new innovations were delivered. Production Manager, Stuart Banyard “We are absolutely delighted at the high level of results for Zephyr and wish to pass our congratulations to all the HALE Team at QinetiQ”. Zephyr offers a real long term solution with its zero emissions and long range ability. Defence solutions include surveillance, communications relay and mapping and Civil solutions such as border control, crop and forestry fire monitoring and fisheries protection.